Jennifer Cooke is a set and costume designer based in Quebec and a graduate of the National Theatre School of Canada. She has designed for the Young Neptune Company, the Prairie Theatre Exchange, Centaur Theatre, and Théâtre Français de Toronto. File contains set designs for Neptune Theatre's lunchtime productions of "Andrew's Tree" and "Two Weeks, Twice a Year," designed by J. Cooke. 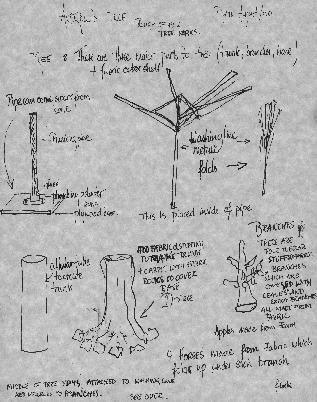 The file includes some original drawings and copies of the set designs for "Andrew's Tree." Location of the original set designs is unknown. Also see MS-3-1, Box 475, Folder 4 (play scripts); MS-3-1, Box 524, Folder 1 (Cast of Andrews Tree grade four Sir Charles Tupper School); MS-3-1, Box 476, Folder 14 (touring itinerary); and MS-3-1, Box 476, Folder 12 (play scripts and touring schedule).